The waitress at the cafe serves you the meal she did not purchase or prepare. The cafe owner purchases the food and the cook labors over every detail of the preparation. Yet, they remain hidden, unknown and unseen. 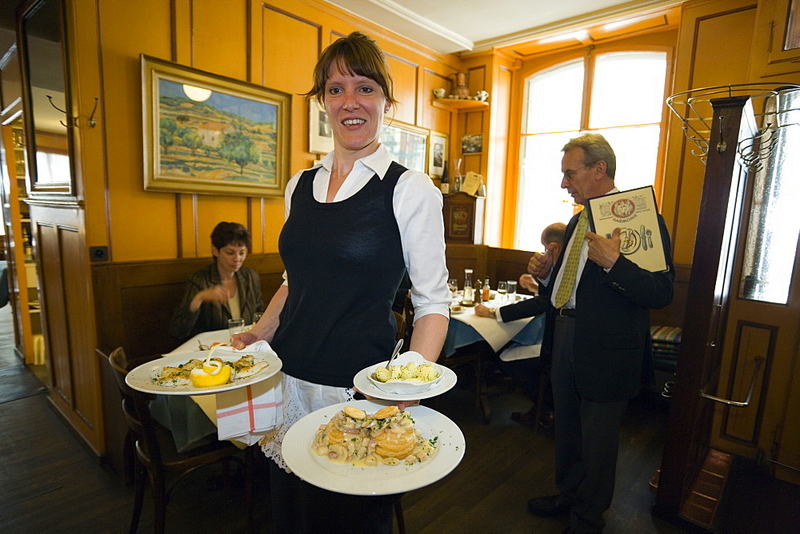 The waitress takes orders and places the food on the table and is the one who hears the words, "Thank you!" In much the same way, pastors take prayer requests and serve you the Good News of Christ. It is appropriate to give them an occasional "thank you," but be sure to give the ultimate credit and glory to God for all that you receive in life, the tangible and the intangible, the physical and the spiritual. “Thanksgiving may be my favorite holiday,” writes journalist Rob Nikolewski. After all, any holiday where you can watch football while the lovely ones in your life ply you with food and drink is, by definition, a great holiday in my book. But it’s also a wonderful holiday for what it is not. It’s not a holiday of forced sentiment such as Valentine’s Day. It’s not a holiday that has morphed into an excuse for excess and associated dopey behavior like you see on New Year’s Eve or St. Patrick’s Day. It is not accompanied by a sense of false piety … that often comes with Easter. It does not require the purchase of neckties like Father’s Day. It does not include the use of fireworks, sparklers or any other explosive, flammable or incendiary material as seen on the Fourth of July. It’s a holiday that hasn’t been ruined by adults who have co-opted it from children and used as an excuse to indulge in ludicrous dress and/or activity like Halloween. It’s more fun than Arbor Day and less sanctimonious than Earth Day. "Thanksgiving, instead, is a day devoid of pretension," says Nikolewski "… There is also something humble about this day. It doesn’t glorify or boast — except possibly to a higher power beyond our own capacity to take credit for. …[It is a ] blessed, unassuming day." There is indeed something quite innately humble about the virtues of gratitude and thanksgiving. Quite possibly, as the writer suggests, because all focus is on those things, those people, and that “higher power” to whom we owe gratitude, rather than on ourselves. “Oh give thanks to the Lord; call upon his name; make known his deeds among the peoples!” (1 Chronicles 16:8). Activists Lindy West, Amelia Bonow and Kimberly Morrison started the #ShoutYourAbortion hashtag on Sept. 19 , in response to the news that the House voted to defund Planned Parenthood. West asked people on Twitter to use the hashtag to share how their lives have been impacted by safe, legal abortion. Women who have had abortions told their stories, and allies used the hashtag to show support for a woman's right to choose. Instead of using the hashtag#ShoutYourAbortion why not drop the PC language and say #IKilledMyBabyAndImProudOfIt? All the boasting in the world cannot magically transform sin into sanctity, or murder into morality. We must guard our own hearts, however, from the equally dangerous delusion of boasting in our own righteousness. The Apostle Paul was quick to point this out to the Corinthian believers who, rather than dealing with the gross immorality in their midst, chose instead to be proud of themselves for being so much better (1 Corinthians 5:2). Long story short, there is only one cause for boasting: “Therefore, as it is written: ‘Let the one who boasts boast in the Lord'" (1 Corintians 1:31).